All trade shows create a buzz. Exhibiting companies plan their stand exhibits and customers look forward to coming to the show to see for themselves what is new and innovative. 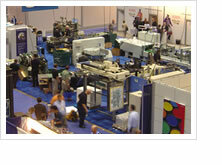 Leading up to Graph Expo 2007, we could tell that this show would be special. The entire floor space at McCormick was sold out for the first time since the year 2000. Pre-registration for visitors was also up. When the show opened on Sunday, 9 September, the buzz became a roar and for the next four days the level of activity was amazing. Kluge had its largest booth space ever in the history of the company: 2,800 square feet with eight machines running. From die cutting, to blanking, to guillotine cutting, to foil stamping and embossing to folding and gluing, our customers were able to see why Kluge is the leader in offering post press finishing equipment. For those prospects at the show looking to expand their finishing capabilities, it was obvious that Kluge now has the product line to meet ALL their needs. A prospect would come to Kluge looking for, say, a die cutting machine and as we walked them through our equipment they would also want information on our paper cutter and our foil stamping equipment. For Kluge, Graph Expo had special importance. For the past few years we have done a lot of research to expand our product lines. This was not easy. The Kluge trade name is very important to us. The industry recognizes the name and associates it with quality, well built equipment. In looking at products we wanted to put the Kluge name behind, it was necessary that the equipment we chose met our standards. At Graph Expo, for the first time, we showed the world what Kluge means today. In cooperation with SBL, Kluge now has a line of vertical foil stamping, embossing and die cutting presses as well as straight line folder gluer machines to compliment our existing line of multi-function folder gluer machines. We also offer a durable, easy to operate line of cutting systems. In cooperation with Kawahara, we continue to sell the automatic blank separator. Manufactured by Kluge, we introduced our new EHG Series Press; a platen style machine capable of feeding a half sized, 23″ x 31″ sheet for foil stamping, embossing and die cutting. This press is designed on the success of the Kluge 14″ x 22″ platen presses which we showed as well. For more information on all Kluge has to offer, please go to our web site at www.kluge.biz or call usat 715.483.3265. 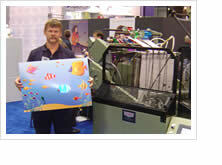 Find out for yourself why Kluge created so much personal buzz at the show and why Kluge truly is Print Finishing World.